A Silicon Valley startup working on self-driving delivery vehicles on Monday announced nearly a billion dollars in fresh funding from the SoftBank Vision Fund. The $940 million in financing from SoftBank brought the total amount of funding raised by Nuro to more than $1 billion, with investors including Greylock Partners and Gaorong Capital, according to the company. The move comes amid surging interest in robotic delivery from a range of companies from small startups to retail giant Amazon. "We've spent the last two and a half years building an amazing team, launching our first unmanned service, working with incredible partners and creating technology to fundamentally improve our daily lives," Nuro co-founder Dave Ferguson said in a release. "This partnership gives us the opportunity to take the next step in realizing our vision for local commerce and the broad application of our technology." 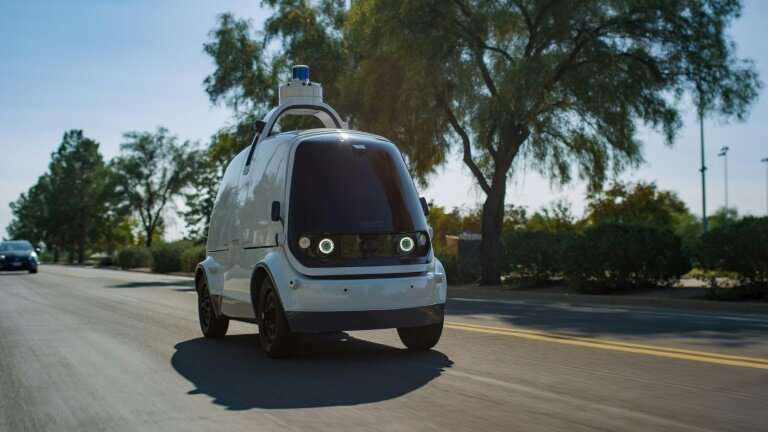 Last year, Nuro—which includes team members who came from Google, Waymo, Apple, Uber, Tesla, and General Motors— began testing its boxy, driverless delivery vehicles in Arizona in a partnership with the large grocery store chain Kroger. The service lets people place online orders and have them delivered by the robotic vehicles, which operate independently by are followed to make sure all goes to plan. "Nuro's world-class team has successfully scaled their self-driving technology out of the lab and into the streets," SoftBank Investment Advisers managing partner Michael Ronen said in the release. Nuro planned to use the funding to expand its delivery service to new locations, increase its fleet of vehicles, and make new alliances. The SoftBank fund, led by Japanese entrepreneur Masayoshi Son, has set a goal of investing at least $100 billion promising new technologies.